Cress takes place right where the previous book left off. I love the way this series is starting to spin off into many different story arcs with more new and interesting characters with each book. Cress is the Rapunzel of space, living in a satellite and her task is to find Cinder, only she wants to find Cinder so she can be rescued, not to reveal her location. Cinder, Captain Thorne, Scarlet and Wolf are together at the start of the book, until the rescue mission to Cress goes wrong when Sybil, the thaumaturge who Cress reports to shows up unexpectedly. The group is separated, Cress and Captain Thorne plummeting down to the Earth and surviving but not without complications, leaving Thorne to rely on Cress more than he would like to admit. A budding romance sparks between the two, but Cress knows she must seem strange and odd to Thorne. Their adventure on Earth was one of my favorite parts of the book, as they get to know each other better and some exciting things happen. Scarlet is taken early on in the book, making Wolf go wild and uncontrollable, not to mention hurt enough in the scuffle at the beginning of the book to warrant worry on his health. Cinder takes him to see the doctor that also has his own plot in this book and plays a larger role. There is also a good portion of the book from Emperor Kai’s point of view in this book as his marriage to Queen Levana approaches. One of my favorite parts of the book was getting a glimpse into Luna as Scarlet is being held there. Princess Winter is an interesting character and I’ll be interested to see what role she plays later on. My only complaint is that after reading Cress, I have to wait many months for the next book in the series. The series is no where close to being wrapped up and I cannot wait to read more. An awesome twist on fairy tales, a series you won’t want to miss. I absolutely adored Cress and couldn’t wait to get my hands on this wonderful novel. 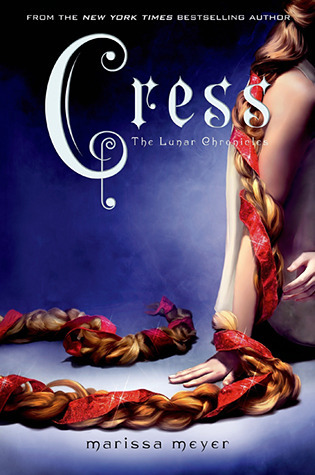 I so enjoyed reading Cress and everything from Marissa Meyer so far. All of the cool kids have read Cress. I wanna be a cool kid. Must get a copy asap.